Listing the teachers who teach classes at your studio is an essential part of publishing your schedule on YogaTrail. All the classes you list will also appear on the respective teacher's profile, so that's more ways for yogis to find their way to your studio. Because the teacher is usually what matters most to yogis in a class, "teacher" is a required field for any class. 1. Existing Teacher: use the pull down menu in the teacher section of the class creation process. The teachers that appear are the ones already associated with your studio. Simply select the right one - done! 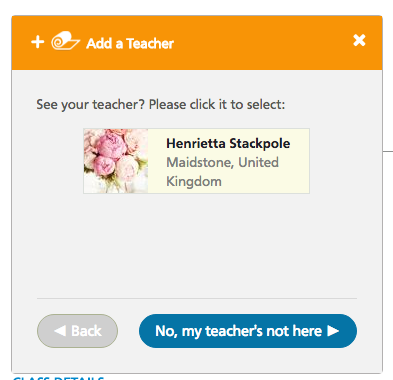 If the teacher for your class isn't on this list, please choose 'Add new teacher', and then click the orange button. When you select a teacher from the list, he/she will be added as your class teacher. When you add a new teacher, please make sure you add their complete name (first and last). There are many thousands of teacher profiles on YogaTrail, and only their full name will allow people to find them on the site. Please note that incomplete entries are periodically deleted. Once you've entered the teacher information, simply click 'Send'. Sorry, but you can only add one teacher per class. 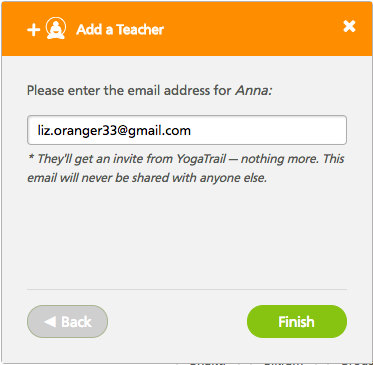 If you don't have the email of the teacher, or prefer not to add it, you can invite your teachers to join YogaTrail directly, create their own profiles, and they list their classes taking place at your studio. These will automatically get added to your studio schedule.